We live in rural Montana, so there aren’t a lot of choices when it comes to Friday night activities. We usually go to dinner and check out what’s going on at the Elks Club (we’re both members), then go home. Not very exciting, even to us. Havre doesn’t have night clubs and even if it did, that probably isn’t the place I would visit all that often. Not my scene. The Elks has officially been in Havre since 1910, but Elks members who were initiated in other places had been gathering in Havre as early as 1904. They would often take the train to Great Falls and attend meetings there, as that was the closest Elks Lodge, and then come home. In 1910, they formed their own club in Havre and eventually built their own lodge on Second Street. They held meetings, fancy dinners, dancing, card parties and all kinds of entertainment in that location until it burned in 1972, the fire starting in the neighboring Crown Jewels store. Operations then went out to the golf course, which they had owned for several years. Sometime later they moved to part of the old Buttrey building, then known as the Atrium Mall, and then in 1980 or 81, they purchased the old Montana Power building, remodeled it, and it is there today. My great-grandfather was one of the first Exalted Rulers, and in 2006 I became the first woman Exalted Ruler for the Lodge. Jamey had been a member for years, and that is were we met. The rest is history, so the Elks will always have a special place in our hearts! 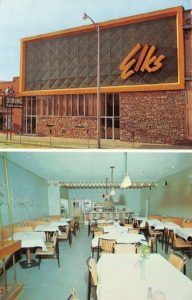 Elks prior to the 1972 fire.